Alltech will be featured at Booth #221 at Aquaculture America 2019 from March 8-10, in New Orleans, LA. Stop by and learn about Alltech’s complete feed solutions for the aquaculture industry. Alltech’s technical experts have a wealth of knowledge on challenges such as fish health, raw materials contamination and nutrient availability. We embrace curiosity and encourage you to ask any questions you may have. 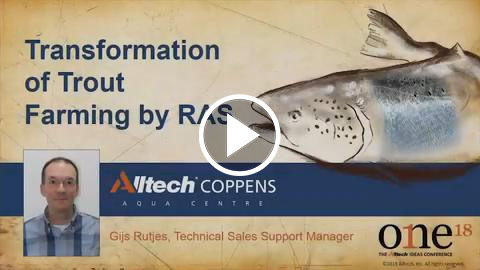 Sign up here to watch a FREE premium presentation from Gijs Rutjes on the Transformation of Trout Farming by RAS. Our Lexington Brewing & Distilling Happy Hour® Happy Hour will take place Friday, March 8 from 5-6 p.m. and Saturday, March 9 from 5- 6 p.m. and will feature our Kentucky Ale® - don't miss it! Stop by our booth and receive a souvenir made on-site with our 3-D printer. Enter for your chance to win a trip for two to the heart of the bluegrass: Lexington, Kentucky and an all-access passes to ONE: The Alltech Ideas conference. We will also have samples of AT-001 and BIO-MOS® from Alltech Life Sciences. Attending Aquaculture America? Click here to join our Facebook event group for more information.